This relatively small city is best known for its clear air and picturesque scenery. Most activities revolve around caves, mountains, rock formations, rivers, lakes, and gardens. All told, Guilin is a photographer's paradise. Boat rides and cruises are a popular way to navigate scenic areas. Elephant Trunk Hill (Xiangbishan) is one of Guilin's most iconic sights. This large natural arch sits on the Li River's banks and resembles an elephant bending down to drink. Like most places of interest in this tourist-orientated city, Elephant Trunk Hill is situated in a park that boasts numerous other attractions and amusements. Guilin is also famous for its caves and impressive rock formations. Visitors should try the Reed Flute Cave for a great hour-long tour through some of the area's most intriguing caves. If travellers are willing to go farther afield, the Tianmen Mountain National Park is about a four-hour drive from Guilin. Tianmen is one of the most impressive scenic areas in China and boasts multiple attractions. 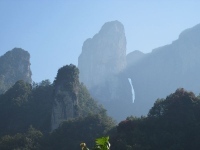 From Zhangjiajie city at the base of the mountain, visitors can take one of the world's longest cableways up the peak. Once there, they can explore many trails, temples, and walkways, including the thrilling Walk of Faith - a transparent glass pavement built on the side of the mountain. Seven Star Park gives visitors a taste of everything Guilin is famous for. Among other things, it features a zoo with Giant Pandas and tigers, extensive gardens, caves, the famous Flower Bridge and Camel Hill. Art lovers will enjoy the Guilin Art Park and the Guilin Arts Museum. For shopping, browsing, and eating out, travellers can head to West Street (also aptly called Guilin Foreigner Street) for numerous restaurants, shops, stalls, and cafes. This is a colourful, vibrant, friendly and multicultural area. We are looking for contributors for our Guilin travel guide. If you are a local, a regular traveller to Guilin or a travel professional with time to contribute and answer occasional forum questions, please contact us.